Weighty Matters: Move Over Babies! Similac Now Pumping Formula for Moms!? Move Over Babies! Similac Now Pumping Formula for Moms!? No this is not a piece from the Onion! Thanks to the University of Western's assistant professor and childhood obesity researcher Dr. Shauna Burke I came across this Frankenfood. It's a formula product made by Similac but instead of being predatorily marketed to Moms to feed their children, it's being predatorily marketed to pregnant women and breastfeeding Moms to feed themselves! And judging from the advertising up above, it would seem part of the marketing pitch is to help make healthier, smarter, babies. "Healthy babies start with healthy moms. That’s why now more than ever, it’s time to really take care of yourself. Part of feeling your best is making sure you get the extra nutrition you need so you have energy for you and your baby"
Energy eh? My experience has taught me "energy" is usually used as a healthful sounding euphemism for sugar. So how much sugar, er I mean "energy", is in a bottle of Similac Mom? 7.75 teaspoons worth of it. And drinking just one premixed 235mL bottle packs the caloric punch of more than a half a litre of sugar enriched, vitamin and protein enhanced, Coca-Cola. "Expectant and breast feeding moms need complete balanced nutrition. 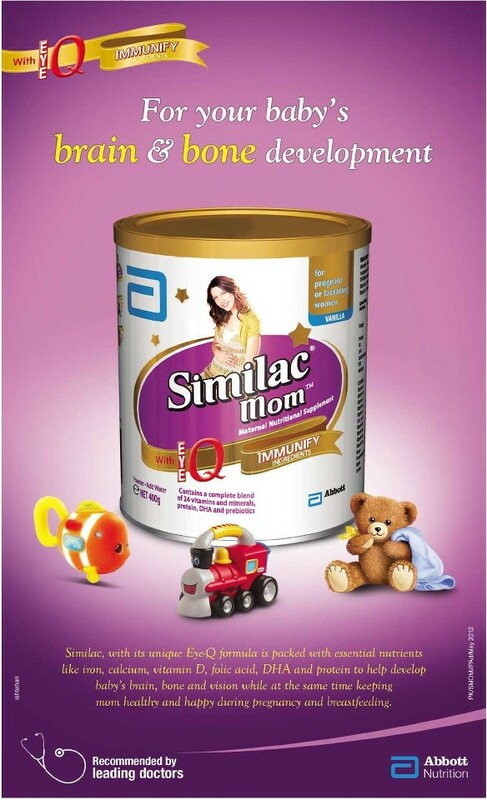 That is why I recommend Similac Mom along with a healthy diet rich in essential nutrients." Really the only "balance" I can think of here is balancing the healthy diet rich in essential nutrients with this vitamin-fortified, sugar-water horror show. Because in my books this product is pretty much the opposite of what I would expect a healthy diet rich in essential nutrients to include. "It is in a formula company’s best interest to have women become emotionally attached to their brand as early as possible—to do so during pregnancy makes complete sense from a business perspective. But, given the link between maternal weight status and child obesity risk and the countless benefits associated with exclusive breastfeeding for both mother and baby, this product—marketed as a “nutritional beverage” despite the fact that it contains more sugar than Coca-Cola - makes no sense from a health perspective." But of course this isn't about health, now is it?